On entering Zigni House on Essex Road we were struck by all the wooden furniture and the emptiness of the establishment, and wondered whether we had walked into a furniture shop by mistake. Our minds were soon put at ease when we were greeted by the friendly waiter, who showed us to a table and handed us two menus. The decor was one of the strong points of the restaurant. Besides all the wood, the walls were covered in traditional African dress and there were animals made out of variety of items. It was all very sensory (exciting for me, as someone who works in the field of autism and thus is somewhere on the spectrum). The furnishings were fun too – colourful, patterned cushions, drums and tea sets. We were looking forward to what was to come, and it certainly didn’t disappoint. 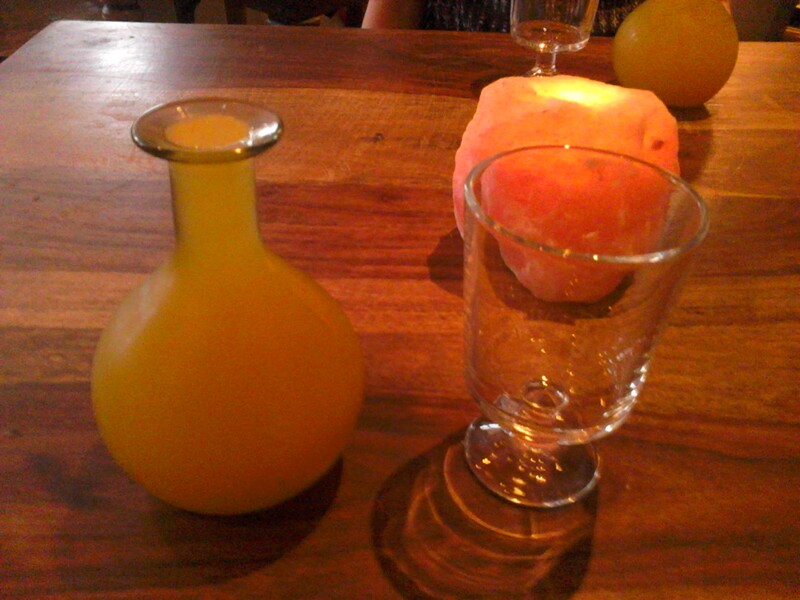 We both ordered the traditional, home-made honey wine, Meyes, which came served in a vessel that reminded us of our chemistry lessons. It was very sweet, didn’t quite go with the mains we’d ordered, but lovely nonetheless. Eritrean cuisine seemed pretty similar to Ethiopian, and after the success of the Injera (big pancake) at St Gabriel’s, we decided to opt for the same. We went for different fillings, Alicha Vegetables (vegetables cooked in special spices) and Zigni Special Foul (a beany dish cooked in onion, tomatoes and spices, served with feta cheese). The Alicha vegetable dish wasn’t the easiest to eat with the pancakes but it tasted good. Probably not quite as good as the Ethiopian Injera but we did get a lesson in how to correctly empty our dishes on to the pancake! Success! Service 8/10, food 8/10, environment 9/10. 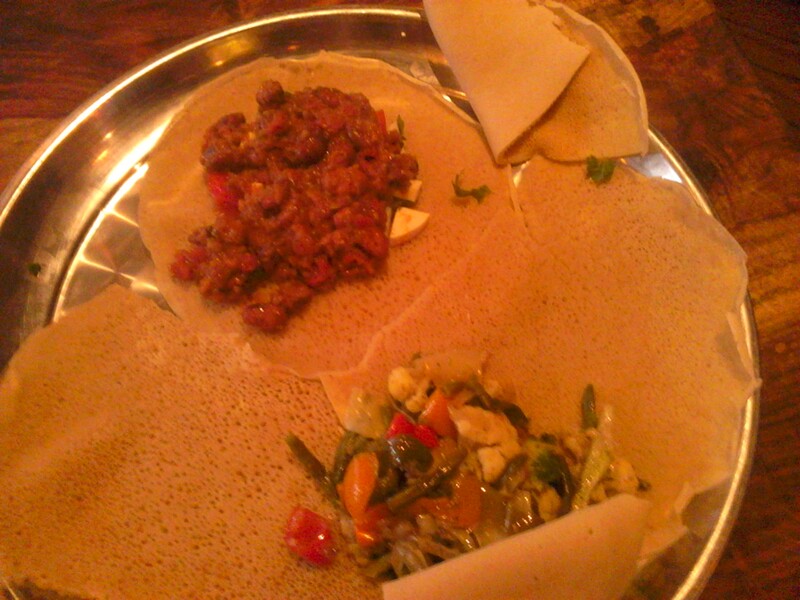 This entry was posted in Uncategorized and tagged dinner, Dinnergeddon, Eating out, Eritrea, Food, Injera, islington, London, restaurants, Zigni House by dinnergeddon. Bookmark the permalink. I’m getting a geography lesson here! Could you point this lovely country out on a map please?!?! Of course. But for the time being it borders Ethiopia. East Africa. I really want to go to a North East African restaurant, but don’t want my first visit to a disappointment. Which do you think I should go for first? Depends how bothered you are about the environment. If you’re not fussy then I would say hit St Gabriel’s (Ethiopia). It certainly impressed us!